Where there is smoke, there is a risk to life, and the SMOKE-WE is ready to raise the alarm to protect people, pets and properties. 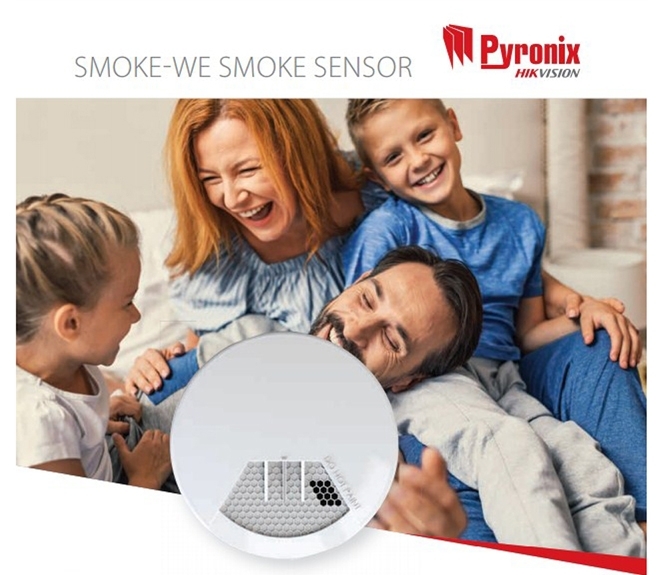 Easy to install and a simple upsell to any Pyronix security system, the SMOKE-WE delivers safety and convenience, with the capability of HomeControl+ App push notifi cations and more. When the battery is running low the SMOKE-WE will begin to chirp once every 32 seconds, as well as send a signal to the control panel to report the issue. If the user has a HomeControl+ App connected to the system, they will also receive a push notification to draw their attention to the problem. With a simple press of a button it is easy to verify the battery status to ensure that the SMOKE-WE is still alarm operational and ready to detect any smoke. The SMOKE-WE has a built-in 85dB local sounder and flashing red LED lights that provide a clearand obvious alarm when smoke is present. If the housing of the SMOKE-WE is not fitted properly during the initial installation, or after a battery change, the rear tamper will trigger to alert that it is not fitted correctly.